"The Reproductive System at a Glance", provides a concise and accessible introduction and revision aid for medical students. Following the familiar, easy-to-use at a Glance format, each topic is presented as a double-page spread with key facts accompanied by clear diagrams encapsulating essential knowledge. 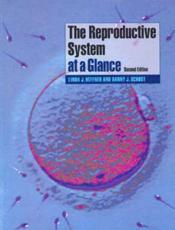 This new edition of "The Reproductive System at a Glance": contains a second colour throughout to enhance the visual appeal, making the subject even easier to understand; introduces the anatomy and physiology of the reproductive system via a clinically focused approach; and has been thoroughly revised and updated and presented in two parts: Part 1 - normal reproduction, Part 2 - reproductive disorders. "The Reproductive System at a Glance", formerly "Human Reproduction at a Glance" will appeal to all medical students, junior doctors on Foundation Programmes, and for those revising for final exams. The book is also suitable for those training in allied health professions, such as midwifery, and biological medicine. Reviews of the last edition: "..." Human Reproduction at a Glance" has the merit that it will remain useful and applicable for the whole duration of the medical course and onward into clinical practice." - "GKT Gazette".